This is the debut eponymous album by the young German (based in Berlin) quartet called SONNEFind albums by this artist, which comprises of saxophonist Philipp GropperFind albums by this artist, pianist Carsten DaerrFind albums by this artist, bassist Johannes FinkFind albums by this artist and drummer Christian Lillinger.Find albums by this artist The album presents nine original compositions, three composed by Lillinger, two each by Daerr and Gropper and the remaining two credited to the entire quartet. 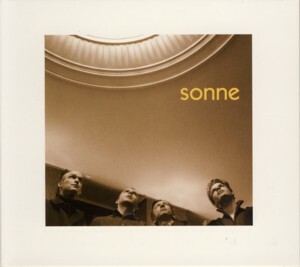 The music of SONNE is quite typical of young European Jazz, which rebels against the mainstream Jazz tradition by decomposing its basic structures and putting them together in a form of a new collage, which is fresh and daring, but not disrespectful. Although unconventional and somewhat Avant-Garde / Free, this music still preserves the basic Jazz qualities of improvisation on a theme and cooperation with the other band members to create a new form of creative expression. This music might prove challenging to the less experienced listeners at first, but after a while it becomes in fact quite logical and even melodic, in spite of the initial strangeness and alienation. It is also beautifully preformed and well recorded, which sums up to quite a satisfactory aesthetic challenge, with should last. Gropper and Lillinger are both members of the excellent trio Hyperactive KidFind albums by this artist, which is also worth following. This album is also the debut release of the small independent German label WhyPlayJazzFind albums on this label, which in the decade since releasing this album became one of the sources of most consistently interesting European Jazz, for which it deserves our gratitude and praise.